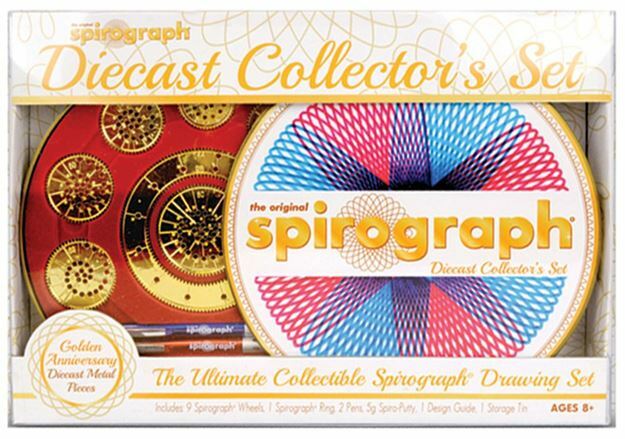 Spirograph, the classic way to create AMAZING designs, is now availbale in a Collectors Set. Featuring golden die-cast metal wheels for a hefty heirloom quality feel and unbreakable longevity! Includes: a golden die-cast metal ring, 9 Spirograph wheels, reusable Spiro-Putty in storage case, red retractable pen, blue retractable pen, design guide and collector's storage tin. Age 8+ years. Distributed in New Zealand by Holdson.